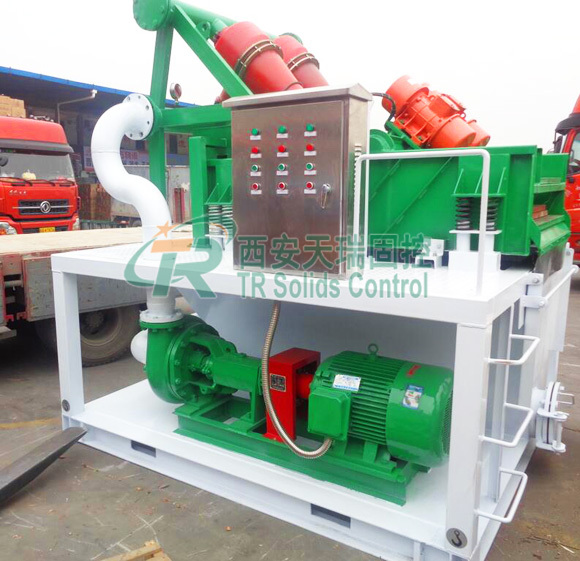 TR bored pile desanding plant is an economic way for the mud recycling. It is very popular for bored piling slurry treatment, HDD (trenchless) industry, TBM slurry treatment as well as water well drilling etc. The whole equipment where mud may splash did seal or block processing, such as plasma around the pool and storage rack connection part completely sealed, which is located around the pool of slurry storage in shale shaker to increase the protective plate and prevent the machine in operation. Mud splash effectively protects the three-phase asynchronous motor unaffected by flying pulp covered its heat dissipation function, which protects the tidy of the machine. High mud handling capacity, sand can be removed efficiently. Mud reuse saves mud making materials and reduces construction cost. Effective separation of soil crusts, pore-forming efficiency is enhanced. It can improve the quality and working efficiency of pore making in the pile foundation. The equipment for modular design and compact structure, making it easy to put in the construction and convenient to move. Mud closed-circuit circulation mode and low ballast material moisture content are helpful to reduce environment pollution. As a well-known manufacturer of desanding plant in China, TR Solids Control always adhere client’s request to the first place. TR Bored Pile Desanding Plant has demonstrated its high-performance capabilities at many job sites worldwide including the applications of bored piles construction, tunneling, micro-tunneling, pipe-jacking, piling construction and diaphragm wall construction etc. Welcome you to inquire at any time!